This little four-letter word can strike fear in the heart of any property owner. However, mold problems don’t necessarily mean the end of the world. Our skilled mold removal technicians at Advanced Restoration complete mold remediation services throughout the area, and we can help assist you in eliminating your property’s mold problems. Yes, mold is usually a serious issue, but our mold removal specialists work with you to provide affordable and effective mildew and mold cleanup. Let us help you make the mold removal process in your residence or place of business simple, cost-effective, and hassle-free. 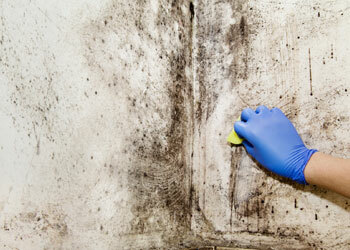 Mold growth can cause safety and health problems for the residents of any property. That’s because almost all molds are dangerous, causing health conditions ranging from hypersensitive reactions to respiratory complications. Some types of toxic mold can also cause brain damage and, in extreme cases, death. If you suspect your property has a mold problem, you need to have it remediated by a professional mold removal technician immediately! All that mold needs to grow is moisture and some source of food like paper, glue, or wood. These are all things found in the ceilings, walls, floors, and possessions in every home and commercial building in the country. Mold problems will build up almost anywhere with high enough humidity levels. This can be caused by flooding or water damage. The initial step in any mold removal job is setting up containment barriers in your property to prevent mold spores from spreading during the remediation process, thereby dispersing the mold throughout the rest of your property and potentially worsening the existing situation. Our mold removal experts utilize state-of-the-art containment processes to thoroughly seal off the area being cleaned up, safely keeping each of the mold spores in a single location. Tailored to suit your property’s specific mold issue, our mold remediation services are developed to fit your unique needs. Contact us to learn more and schedule an appointment with Advanced Restoration today.